FOR THE VATICAN MUSEUMS ARE INCLUDED! We reserve Your tickets in advance and then You can enjoy the visit without queue. On Wednesdays the Basilica of Saint Peter is closed in the morning for Papal Audience. 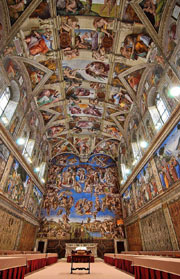 Tour will feature more of the Vatican Museums and Sistine Chapel. The Vatican Museums are packed with the treasures accumulated over the centuries by the popes. There's the incomparable Sistine Chapel, such priceless ancient Greek and Roman sculptures as Lacoon and the Belvedere Apollo, buildings whose walls were almost completely executed by Raphael (including his majestic School of Athens), and endless collections of art ranging from (very pagan) Greco-Roman antiquities to Christian art by famous European masters. The S. Peter's Basilica is not only huge, but also a monument to artistic genius. The first basilica was built here by Rome's first Christian emperor, constantine, in the 4th century. More than 1000 years later the basilica had fallen into disrepair. In the mid-15th century Nicholas V took a stab at its reconstruction, but it was not until 1506, when Julius II employed Bramante, that serious work began. It took more thatn 150 years to complete the new basilica, now the second biggest in the world. Bramante, Raphael, Antonio da Sangallo, Giacomo della Porta and Carlo Maderno, all contributes, but it is generally held that St. Peter's owes most to Michelangelo, who took over the project in 1547 at the age of 72 and was responsible for the design of the dome. Supplied by the water from the Acqua Vergine aqueduct and a triumph of the baroque style, it was based on the design of Nicolà Salvi (who's said to have died of illness contracted during his supervision of the project) and was completed in 1762. The design centers on the triumphant figure of Neptunus Rex, standing on a shell chariot drawn by winged steeds and led by a pair of tritons. Two allegorical figures in the side niches represent good health and fertility. Put cutlets into pot, together with diced onion and spices. Add Liquamen, oil and wine. Cook 45-60 minutes. Pour sauce into a pan and thicken it with starch. Serve cutlets together with the sauce.